In today's competitive business environment, digitizing an organization can exponentially increase innovation and business growth. Technology has become one of the fastest growing fields, so it makes sense that companies that have invested in IT projects have also achieved fast growth. Despite this relationship, some organizations are still concerned with the expenses that IT projects have. Since IT projects can have such massive effects on a company, it is imperative that you try and get the most out of each project. Where do you start? Regardless of the complexity and scope of your projects, we have compiled five easy steps that will act as a framework in developing your IT project. Many IT projects are destined to fail from inception. You need to strategically decide the best time to start a new project, figure out which business might be involved in it, and make sure everyone is perfectly aligned with your IT efforts for adoption and success. A little patience can really pay off. Understanding when it's not the best time to launch a project can save time and effort in the long run. It's better to take a step back and assess the full picture, remembering that digital transformation is not a thing that happens overnight. You need to set the foundation first. This is just as important as waiting for the right time. As a department, IT needs to be ready to roll as fast as possible, reacting quickly to new demands. Remember that if you are not fast enough to take action, you might miss the "right moment". Running agile projects might mean reducing the time between alpha and beta testing to deliver a viable product faster. Identify areas of improvement for existing IT projects to better prepare for future ones. IT projects are just like any other project, you will encounter quite a few challenges before achieving success. In fact, you might find all the roadblocks at the same time so be ready! When establishing your project framework, make sure to create contingency plans that are actionable and clear. This will help you to reduce downtime and keep your project afloat when difficulties arise. If your teams are not ready to overcome the issues, your business will begin to doubt your efficiency in delivering what was promised. This will affect your overall outcome, so be smart and prepare for mistakes. As your project develops, you're likely to come up with new improvements that weren't originally part of the framework. You need to be extremely selective in choosing which improvements to include, always ask the question: "Is this helping me achieve the goal?" If the answer is no, don't add it. Idea generation is extremely important in the process of developing a project, but it is important to distinguish constructive ideas from lateral ones. Make sure to let everyone at least voice their opinion in a brainstorming session, but you do not need to incorporate every idea. Keep the project as close to your original goal as possible, only using new ideas if absolutely necessary. Once your goal is achieved, you can begin adding bells and whistles. 5. Do I have what it takes? When you are setting up a new IT project, assess the specific skill sets your team must have to reach the goal, do you have what it takes or will you need advice? Although nobody knows your business better than you, people who's job is to deploy IT projects across multiple industries have the know-how into the specifics of a particular technology. Combining business knowledge with technology expertise creates a winning formula for delivering the IT projects your business needs for digital transformation. Assess your skills and search for help in unfamiliar areas. Remember that agility is key and sometimes receiving on-time advice from experts can accelerate the pace of your project while delivering the best possible outcome. Ask for help as soon as you think you need it, don't wait until you're drowning to ask for a lifejacket. 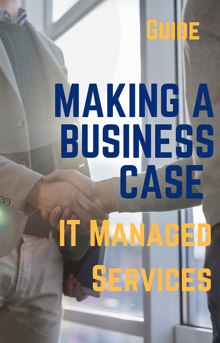 When partnering with an IT Managed Service Provider making a strong business case is imperative. Some of the benefits include resource reallocation, and cost efficiency as the MSP is the one managing the IT infrastructure including network, systems collaboration, and security. What's next? Download the full guide and get a better idea of how to structure a business plan where Managed services becomes an enabler of your business goals.